A few weeks ago I decided to get my act together and hire an assistant to help with marketing, organization, etc., all the things many freelance medical writers are simply too busy to attend to until, one day, you realize you haven’t had to work a full weekend in 2 months and you begin panicking about your (now normal) workload. Now, I can thankfully report, I found a wonderful assistant in my friend and marketing maven Katy and I’ve had to work the past two weekends. I do think the recession is fading! All of which is a long-winded way of saying that Katy informed me right off the bat that I must have a blog. So, welcome to my blog. 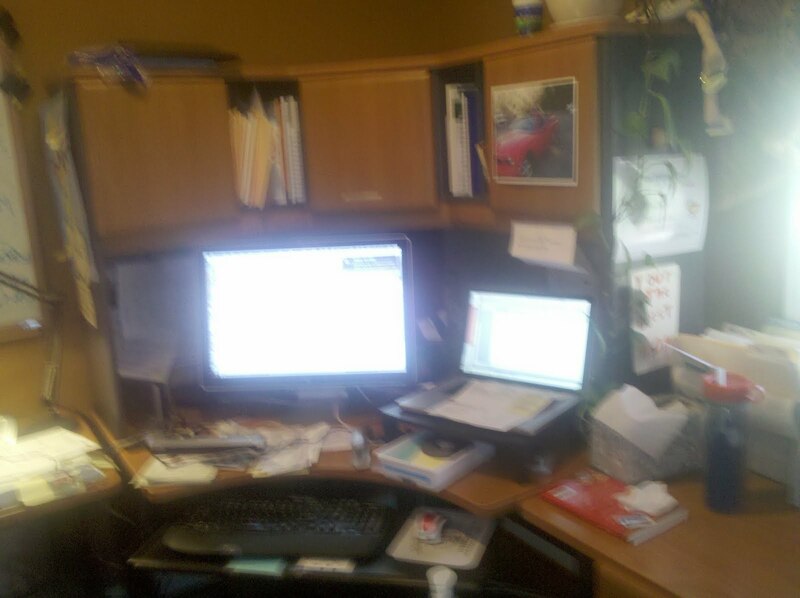 The purpose of which is to give you a peek into the inner sanctum of a medical writer, misspellings, all-nighters, messy desks (see photo below) and all. Although it may get me into trouble, I plan to blog about current controversies in medical writing, including “ghostwriting” and CME funding, issues that, to my mind, have totally gotten out of control. A bit of background: I’ve been freelancing now for 10 years. Prior to that, I spent 15 years as a newspaper reporter covering health and medicine, a manager at a mid-sized managed care company, and a writer/editor at a major health publisher. So, as you can see, with the exception of medical school, I’ve nearly done it all when it comes to health and medicine! From the clinical to the policy side, from consumers to professionals. I just can’t imagine anything more interesting than writing about health and medicine! Now, as I tell my clients, the point of a blog is to be current and interactive. To that end, I want to hear about you as well, and about what you’d like to hear more about from me. As for the current part–I plan to post no less than once a week, more if circumstances dictate. So . . . with no further ado. . . . here we go. Thanks, Jane. You only saw half the mess! I have another table behind me. You know what they say about a messy desk and brilliant mind. . . Newer The check is in the . . . .